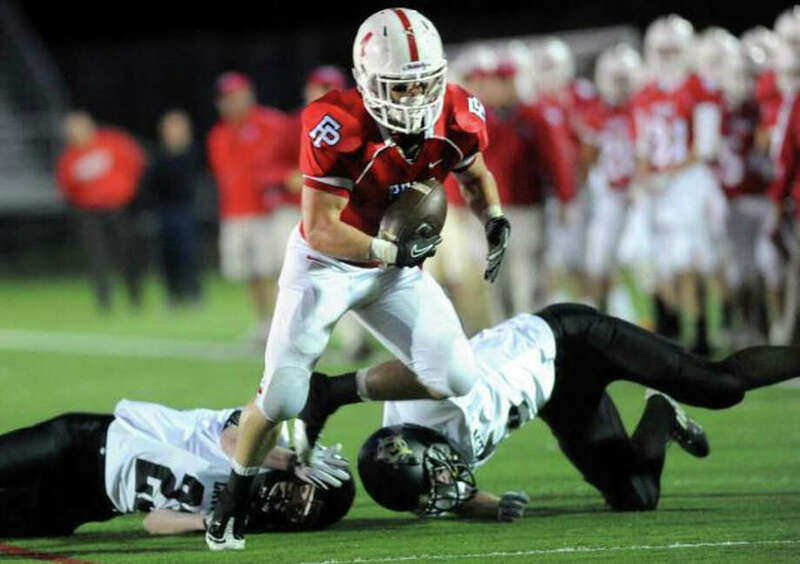 Can Shane Dempsey and the Fairfield Prep football team clinch a winning season with a Thanksgiving win over West Haven? Football and Thanksgiving go together like peanut butter and jelly. The Lions have played on Turkey Day every year since 1953. The Cowboys joined them in 1966 and have played on Thanksgiving since. But high school football on Thanksgiving is Americana. Thousands of high school football games played around the country and some of the oldest rivalries in the sport will be contested Thursday morning. The town's highest attended football game this year will be Thursday between Ludlowe vs. Warde, unless somehow Prep's game with West Haven attracts more followers. In other parts of the USA, Thanksgiving games have become obsolete with the rise in state playoffs, but it is nice to know Connecticut maintains that tradition. I'm sure I don't need to remind everyone that I've had my most successful season picking games. And here is the last chance for me to improve upon that. Each game provides its own storylines and, contrary to Warde fan opinion, they'll all be evenly matched games. Let's all be thankful for the football ahead. Thursday, Taft Field, 10 a.m. I could classify this as the game of the year. I get comments, questions and insights about Ludlowe and Warde a lot during the fall season and now the bragging rights game is here. Ludlowe's had an abysmal year with injuries, embarrassing and lopsided losses. The Falcons' closest defeat was a 6-0 loss at otherwise winless Harding. Ludlowe's offense has only scored 72 points this season and many of those have come in the second half against JV competition. The Mustangs, on the other hand, have taken care of every opponent they should have beaten. Warde's four victories have come against opponents that have combined for eight wins. The Mustangs have been competitive in every game, and barring second half collapses, could be a Class L playoff team. But that's neither here nor there. Warde's not taken care of business in those games, and it could be argued that it's season is as lost as Ludlowe's. A 5-5 record is frustrating enough to Duncan DellaVolpe, but a 4-6 campaign-- which would be DellaVolpe's worst as the Mustangs' coach-- would be worse. Think about great football rivalries. The adage is "Ludlowe could go 1-9, but if the 1 is against Warde, it's a successful season." There's no reason for me to realistically think the Falcons can compete. Warde's running game-- with Devon Lofton, Joe Marx and David Wolff-- and the Mustangs' tough offensive line should be able to dominate the young, undersized front for Ludlowe. But there was no reason for anyone to think that last season's game should've been close. Yet, there Ludlowe was, an onside kick away during a 21-16 loss a year ago. Ludlowe coach Matt McCloskey is 2-1 against the Mustangs, and I expect this game to be competitive for a while. But in high school football, the better team often wins, even in rivalry games. Thursday, Alumni Field, 10:30 a.m. The Jesuits had a Murphy's Law night on Friday at ND-West Haven. Before Prep could breathe, it was behind 21-0. Tom Brewster was suspendeded for the first quarter and Strecker Backe had his only pass intercepted and taken for a touchdown. The Westies scored points against Xavier and Daniel Hand, which is more than Prep can say. But Prep dominated Hamden and Wilbur Cross, which is more than West Haven can account for. I think-- assuming Brewster isn't suspended-- Prep will be able to run the ball and put up some points against West Haven. An above .500 season motivates Prep and the Jesuits haven't beaten West Haven since 2007. I'd love to pick Prep in this game, but I can't. All you Jesuits' loyalists can chide me if they somehow find a way to win. West Haven 27, Prep 21. Thursday, McCarty Stadium, 10:30 a.m.
Barring another suspension, ND will dress 19 for its final game of the season. The Lancers are a tough lot, though. Nigel Beckford does everything for ND. He played every down on Saturday at Oxford, taking snaps at quarterback, running back, punter, linebacker and defensive end. I believe the Lancers are too tough to go winless. But their numbers are egregiousally low and it's almost impossible for ND to compete. Immaculate could claim the same, although its roster size will be substantially larger than the Lancers. I hate to pick against all the Fairfield teams, but I don't pick these games to get wrong. Last week: 3-1; Year-to-Date: 32-4.